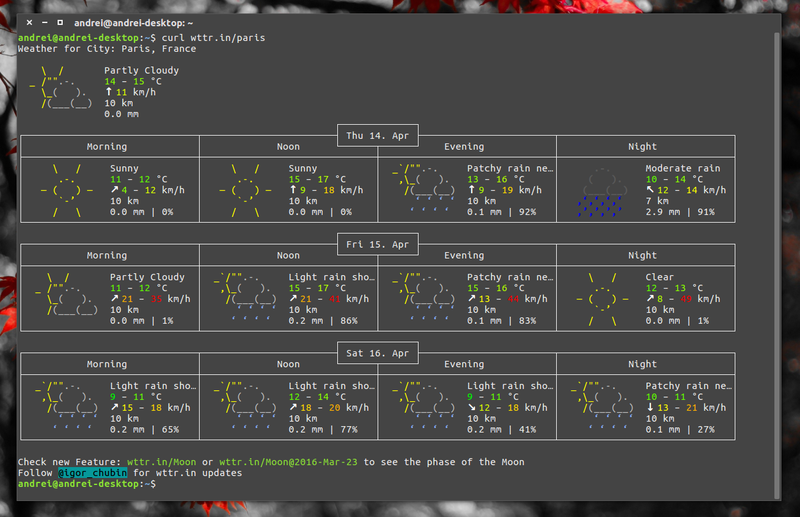 wttr.in is a web frontent for Wego, a weather app for the terminal. Using nothing but cURL and wttr.in, you can get weather information from a terminal, without having to install anything (well, except for cURL). By default, the service tries to determine your location automatically but if that fails, it allows you to specify the location in multiple ways, by city name, 3-letter airport code, ZIP code and it even allows retrieving the weather for the location of a domain name or IP address. Other features include a 3-day weather forecast, display moon phase and support for both metric (SI; used by default everywhere except the US) and USCS (used by default in the US). Under the hood, wttr.in uses WorldWeatherOnline for the weather information, though this might change in the future because Wego, the tool which wttr.in uses as its backend, recently switched to forecast.io by default. While it's not required to install wttr.in to use it, you can install it on your server if you want - see the installation instructions HERE. From what I've read, it looks like wttr.io fails to get the location pretty often so to make it easy to use, you can add an alias to your ~/.bashrc file so you can simply type "wttr" to get the weather for your location. After you're done, you can simply type "wttr" in a terminal to check the weather.